Pennsylvania health, fitness, and nutrition leaders will present a state fitness and nutrition education day for men at the PA Capitol as Governor Tom Wolf proclaims June as Pennsylvania Men’s Health Awareness Month. Join us for a press conference, free health screenings, and fitness demonstrations on Friday, June 16, 10 a.m. - 12 Noon to #GetHealthyPA. Nadia Sharifi and Chef Wes Stepp, owners of Tastefully Fit TrimLine, will join state and community leaders to call for Pennsylvania men to #GetHealthyPA. Men need to be better caretakers of ourselves, get regular checkups, and do simple screenings that can help reduce our risk factors for heart attack and cancer. Our goal with Tastefully Fit TrimLine is wellness that tastes good. Tastefully Fit TrimLine invites you to #GetHealthyPA and celebrate Pennsylvania Men's Health Awareness Month on Friday, June 16, 10 a.m. - 12 noon at the Pennsylvania State Capitol in the East Rotunda. 10 a.m. Press conference and presentations by community health and wellness champions featuring Tastefully Fit TrimLine owners Nadia Sharifi and Chef Wes Stepp, Senator Mike Regan, and presentations of the Governor’s Proclamation and Senate Resolution declaring June as Men’s Health Awareness Month in Pennsylvania, and June 16 as Fitness and Nutrition Education Day in Pennsylvania for Men. Nadia Sharifi and Chef Wes Stepp, owners of Tastefully Fit Trimline, a Mechanicsburg, PA-based health and wellness company dedicated to creating a healthier Pennsylvania, present June as Men’s Health Awareness Month in Pennsylvania and June 16 as Fitness and Nutrition Education Day in PA. Nadia is a food chemist and owner and operator of the highly successful TrimLine Weight Loss Centers. Chef Wes Stepp is the owner of Red Sky Café. Wes Stepp, co-owner of Tastefully Fit TrimLine, says, “My journey to good health took many wrong turns, and I know the struggles men face in embracing healthy lifestyle choices. As a chef, I know good nutrition is the key to healthy living. As a father, son, and business owner, I’m compelled to take a lead in the health and wellness education conversation. Men need to be better caretakers of ourselves, get regular checkups, and do simple screenings that can help reduce our risk factors for heart attack and cancer. Our goal with Tastefully Fit TrimLine is wellness that tastes good." On average, American men live sicker and die younger than American women, Men's Health Network. Every 39 seconds, someone dies from heart disease and stroke, Matters of Your Heart, American Heart Association. Heart disease is the leading cause of death for men in the U.S., accounting for 1 in every 4 male deaths, Centers for Disease Control and Prevention. Men are 50% more likely than women to die from heart disease, Harvard Health Publications. Men are 24 percent less likely than women to have visited a doctor within the past year and are 22 percent more likely to have neglected their cholesterol tests, U.S. Department of Health and Human Services. Lowering your blood pressure may decrease your risk of stroke and heart disease by about 50%, Matters of Your Heart, American Heart Association. 99% of Americans need to improve their heart health, Matters of Your Heart, American Heart Association. 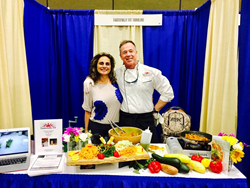 Tastefully Fit TrimLine was created with the combination of Nadia Sharifi’s (owner and operator of TrimLine Weight Loss Centers) expertise in food science and nutrition and Wes Stepp’s (owner of Red Sky Café) healthy cooking. Tastefully Fit TrimLine is a lifestyle change, not a diet. The program is centered on health and wellness to create a style of living that is sustainable, and to ensure a better quality of life now and for the future without forfeiting flavor. Nadia opened TrimLine independently in May 2009 in Lemoyne, Pennsylvania. Currently there are four locations including Lemoyne, Harrisburg, York, and Lancaster. Wes has been working as a chef for over 25 years. His cuisine reflects the best of what the coast offers, always fresh and succulent. In addition to operating his restaurant, Chef Wes has a thriving catering business. For more information on Tastefully Fit TrimLine, or to learn about becoming a healthier you, visit http://www.mytrimline.com or call 717-982-7181.